Lisfranc injuries are commonly associated with sporting injuries and are easily diagnosed with severe midfoot pain, swelling, deformity and inability to bear weight centred on the second tarsometatarsal joint. Amit Chauhan, P. Raju and Rajiv Limaye discuss the controversy surrounding the joint. Lisfranc injury commonly describes injury to the midfoot centred on the second tarsometatarsal (TMT) joint [1,2]. Historically, the Lisfranc joint is named after a French army surgeon and gynaecologist, Jacques Lisfranc de St Martin (1790–1847), who originally described amputation through the joint . There has been a controversy in the use of ‘Lisfranc joint’ and ‘Lisfranc joint complex’ in the literature, and it has been suggested that Lisfranc joint complex should refer to TMT articulations, whereas Lisfranc joint should mean medial articulation between the first and second metatarsals with medial and middle cuneiforms . Injuries to the foot are common in athletic population, accounting for approximately 16 per cent of all sporting injuries. TMT joint injury is the second most common trauma pattern, second only to metatarsophalangeal (MTP) joint injuries [5,6]. The incidence of Lisfranc injuries have been reported to be one in 55,000 annually, accounting for approximately 0.2 per cent of all fractures . These injuries have shown to be co-existent with tarsal and metatarsal fractures . The incidence of Lisfranc injuries is rising and has been reported in various sports, including horse riding, football, gymnastics and running [8,9]. Though these are common in athletes, it has been reported that one-third of injuries occur in low-energy sport trauma. More commonly (87.5 per cent), these are closed injuries . Anatomically, the Lisfranc complex consists of an intricate balance of various bony and ligamentous structures. The midfoot is classically divided into three columns: medial, middle and lateral. The medial column consists of the first metatarsal, medial cuneiform, and its navicular facet; the middle column consists of the second and third metatarsals, their corresponding cuneiforms, and the central and lateral facets of the navicular; the lateral column consists of the fourth and fifth metatarsals and their articulations with the cuboid . Much of the bony stabilisation is as a result of recession of the base of the second metatarsal into a mortise formed by the three cuneiforms, and the trapezoidal shape of the middle three metatarsal bases, often referred to as Roman arch . The base of the second metatarsal is recessed approximately 8mm relative to the distal articular surface of the medial cuneiform and 4mm relative to the lateral cuneiform, and is recognised as a keystone that helps lock in stability to the midfoot and Lisfranc complex . The plane of the TMT joints is relatively perpendicular to the ground, leaving little inherent bony stability during stance. Hence ligamentous anatomy is essential to maintain appropriate alignment and stability of articular structures. The ligamentous anatomy of TMT articulations is very complex with three types of ligaments: dorsal, plantar and interosseous. All TMT articulations are crossed by dorsal and plantar TMT ligaments. The second through to the fifth metatarsal bases are also linked by intermetatarsal ligaments; however, there is no intermetatarsal ligament between the first and second metatarsals. Plantar ligament from the lateral side of the medial cuneiform to the medial side of the second metatarsal is referred to as the ‘Lisfranc ligament’. The first and second TMT ligaments, with the Lisfranc ligament, are often collectively referred to as the ‘Lisfranc ligament complex’. The Lisfranc ligament is the strongest and thickest, and is vital in stabilising the second metatarsal and consequently maintaining the midfoot arch [2,14]. Strengths of these different ligaments have also been controversial. A biomechanical stress study revealed the Lisfranc ligament to be the strongest, and the dorsal ligament the weakest . The arc of motion at the TMT joints is minimal because of both osseous and ligamentous constraints, with approximately four degrees of dorsiflexion and one degree plantar flexion noted at the first TMT joint and even less arc of motion at the second and third TMT joints. The lateral column of the midfoot, which includes the fourth and fifth TMT joints, has much more mobility (nearly 10 degrees of dorsiflexion and plantar flexion) and as a result is able to better tolerate subtle instability . This becomes relevant when open reduction and internal fixation of these injuries are performed, as discussed later in the Management section. Historically, Quenu and Kuss described a classification system for TMT and Lisfranc injury in 1909 . The authors divided these injuries into isolated, homolateral and divergent categories. Isolated injuries have one or two dislocations of the metatarsals, with the rest of the metatarsals being stable. Homolateral injuries have all the metatarsals dislocated in one direction, whereas divergent have metartarsals displaced in different directions in sagittal and coronal planes [3,18]. This classification was later modified by Hardcastle et al. in 1982 by amending the three categories. Homolateral or total incongruity can include medial or lateral dislocation. Isolated or partial incongruity was divided into medial and/or lateral dislocation. The divergent category included lateral displacement of the lesser metatarsals with the first metatarsal dislocated medially. The divergent injuries can be partial or total, depending on the number of lesser metatarsals affected . Further modified by Myerson et al. in 1986, the B and C categories have been further subdivided into B1 (first ray medial dislocation), B2 (first ray lateral dislocation), C1 (divergent partial displacement) and C2 (divergent total displacement). The above classifications are good for high-energy injuries but these do not address low-energy subtle injuries. Recently, Nunley and Vertullo described a classification system which addresses these subtle injuries. Stage I injuries include patients with pain at Lisfranc complex on examination who are unable to participate in athletic activity but do not demonstrate any evidence of instability on weight-bearing radiographs. In this stage, MRI is often positive for a sprain of the Lisfranc ligament and oedema at the involved bones. Stage II injuries demonstrate 2 to 5mm of diastasis at the Lisfranc joint on a weight-bearing AP radiograph without loss of arch height on the lateral radiograph. Stage III injuries demonstrate greater than 5mm of diastasis at the Lisfranc joint on the weight-bearing AP radiograph with loss of arch height and loss of distance between the plantar aspect of the fifth metatarsal and medial cuneiform on the lateral radiograph . This classification was modified by Eleftheriou and Rosenfeld in 2013. Grade 1 injuries remain the same, while Grade 2 injuries demonstrate 2mm or less of displacement on weight-bearing radiographs and/or diastasis on CT or intraoperative fluoroscopy. Grade 3 injuries include any diastasis more than 2mm on weight-bearing radiographs or an injury that meets any of the Myerson classification parameters . Broadly, Lisfranc injuries can be a result of direct or indirect trauma. With direct injuries, the direction of displacement is dependent on the point of application of the injuring force. When direct force/axial load falls on the dorsum of the foot, it creates a tensile force on the plantar side of the TMT joints, and if the force is strong enough, the Lisfranc complex becomes unstable following ligamentous disruption/fractures/dislocations. The intensity and angle of the force will determine whether there are fractures and/or ligamentous injuries . These injuries have the propensity for severe neurovascular compromise and foot compartment syndrome . Low-energy indirect trauma is more common  and is mainly a result of bending and twisting movements as encountered in sports. The history and mechanism of injury determine the severity, stability and prognosis of the injury. The injury pattern may be a ‘benign’ or a partial sprain, whereby only the weak dorsal intertarsal ligaments are torn and the strong plantar ligaments remain intact. In this scenario, there is no widening of the intermetatarsal space, and return to activity is dependent on pain and discomfort. With higher energy patterns, the strong plantar ligaments are also torn, making the TMT complex very unstable, leading to dorsal dislocation of the metatarsals . Frank Lisfranc injuries are easily diagnosed with severe midfoot pain, swelling, deformity and an inability to bear weight. Clinicians should always look for any neurovascular compromise or signs of any compartment syndrome that needs immediate attention. It is the more subtle variety which needs a high index of suspicion: there can be pain along with some swelling and tenderness around the Lisfranc region without deformity or loss of medial arch. Although weight bearing is painful, it is often possible, which creates confusion about the extent of the injury . There are a few subtle signs – such as presence of plantar ecchymosis, gap sign (which corresponds to diastasis between the first and second metatarsals) and malalignment of the metatarsals – which can be of immense value in diagnosis of these confusing injuries [25–27]. 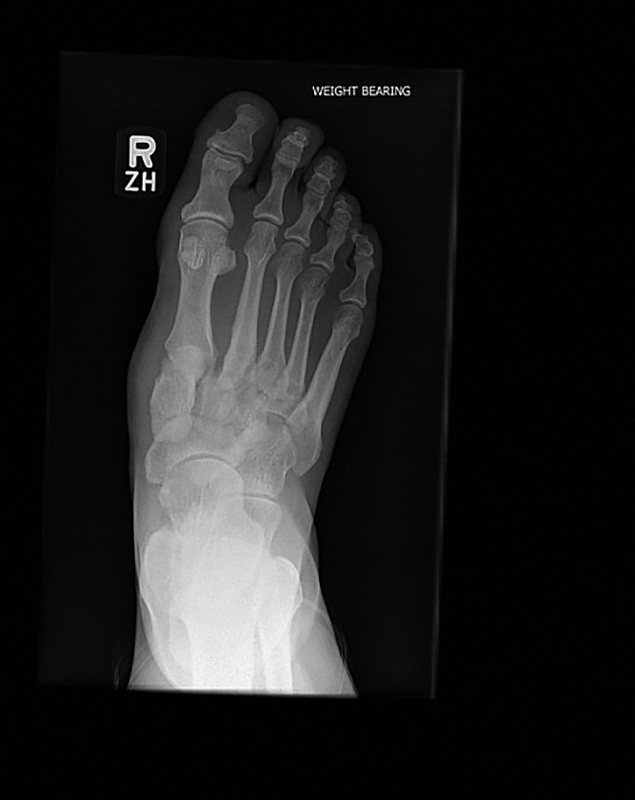 In patients who can still put weight onto the affected limb, midfoot pain while walking downstairs is a valuable clue in diagnosing a subtle Lisfranc complex injury. Plantar ecchymosis is considered pathognomonic for a Lisfranc injury and should be followed by a thorough clinical and radiographic evaluation, even if initial radiographs do not demonstrate an obvious fracture or instability . Different tests and manoeuvres have been described in the literature to diagnose the subtle variant. The piano-key test, in which the metatarsal is grasped and dorsiflexion and plantar flexion are performed at the TMT joint, may elicit pain at the involved joints. Shapiro and colleagues recommended two provocative tests – namely the midfoot compression test and dorsal and plantar manipulation of the first metatarsal head relative to the second metatarsal head . The compression test involves stressing the first and second metatarsals in the coronal plane across the bases of the medial and middle columns: pain or a palpable ‘click’ indicates an injury to the Lisfranc complex. Manipulation of the first metatarsal in the sagittal plane might produce false-negative results, as the medial column may not be involved in the injury pattern . Figure 2: Dorsoplantar weight-bearing radiograph showing malalignment of the second metartarsal with the medial cuneiform and widening of the joint space between the bases of the first and second metartarsals. Lisfranc injuries are investigated initially with radiographs. Non-weight-bearing radiographs (Figure 1) can reveal more obvious fracture-dislocations but can miss subtle injuries and diastasis between the first and second metatarsals in up to 50 per cent of cases . Hence, weight-bearing anteroposterior (AP), lateral and 30 degrees oblique radiographs (Figure 2) should be the first line of investigation to identify and confirm Lisfranc injuries. These weight-bearing radiographs can be very painful and regional anaesthesia with an ankle block has been recommended in the literature . Diagnosing subtle Lisfranc injuries has been a challenge to all orthopaedic surgeons. In addition to weight-bearing radiographs, it is good practice to radiograph the other foot to identify these subtle changes . Stress views have also been mentioned but only a limited force can be exerted on the TMT joint; also, this will be more painful and will definitely need anaesthesia in acute setting . Cranio-caudal angulation of 28.9 degrees in AP radiographs improves visualisation of the Lisfranc joint . Lack of knowledge of abnormalities among junior staff could also be another reason for missed diagnoses. Lisfranc injuries are associated with other additional injuries in up to 39 per cent of cases, which can easily distract the clinician and lead to these subtle variations being missed . One of these is nutcracker fracture, where the cuboid is crushed between the fourth and fifth metatarsal bases and the anterior calcaneus . Radiological alignment should be assessed in all weight-bearing radiographs . On the AP projection, the lateral border of the first metatarsal is aligned with the lateral margin of the medial cuneiform, and the medial border of the second metatarsal is aligned with the medial border of the middle cuneiform. On the oblique projection, the lateral border of the third metatarsal is aligned with the lateral margin of the lateral cuneiform, and the medial border of the fourth metatarsal is aligned withthe medial border of the cuboid bone. ‘Gap sign’ is the distance between the bases of the first and second metatarsals and it should not exceed 2mm. 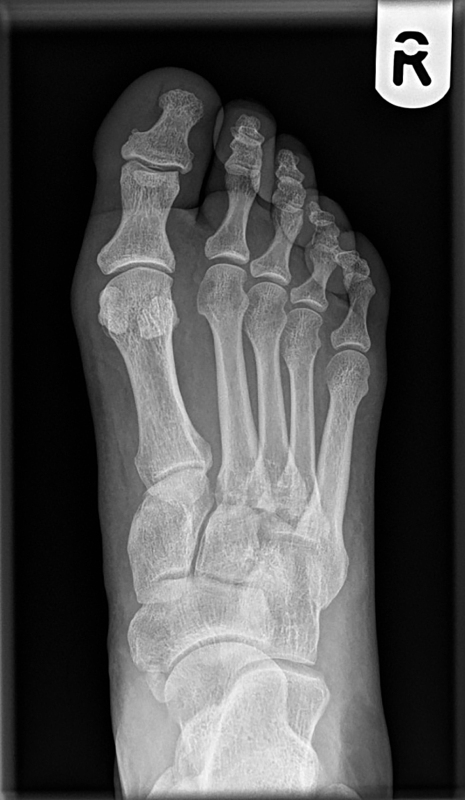 ‘Fleck sign’, a small chip of bone found between the bases of the first and second metatarsals is pathognomonic of this injury and indicates avulsion of the Lisfranc ligament. A Lisfranc injury can be a bony or ligamentous variant depending on whether it is evident or not on radiographs. A tendency for radiologists in the UK not to review some images has been mentioned in the literature; this can be really inappropriate, especially in context of this highly missed injury . We believe that whenever there is suspicion of these injuries based on mechanism of injury and clinical findings, it should be highlighted and reviewed by a musculoskeletal radiologist, in addition to a senior orthopaedic consultant. In one study from the UK, in spite of recruiting nine senior clinicians (three consultant radiologists, three consultant orthopaedic surgeons and three senior emergency department doctors), Lisfranc injuries were missed in 19 per cent of cases. 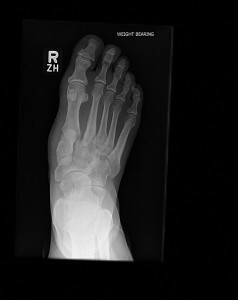 Further scanning in the form of CT/MRI can confirm strong suspicion of Lisfranc injury on weight-bearing radiographs. Multi-detector CT can be useful in bony variants and in settings of multiple trauma patients where it can be difficult to make adequate clinical assessment or obtain weight-bearing radiographs . CT can visualise bony anatomy and articular alignment diagnosing more subtle subuxations and fractures. Though CT can be used for preoperative planning, ligaments cannot be visualised [1,2,8]. MRI becomes very useful in diagnosing the ligamentous variant of subtle Lisfranc injuries which might have been missed by previous investigations (see Figure 3). MRI has shown a sensitivity and positive predictive value of 94 per cent in predicting Lisfranc joint instability  and should be carried out in clinically suspicious injuries where radiographs and CT are normal . There have been many controversies related to management of Lisfranc injuries. Before touching upon these controversies, we would like to highlight the general principles of managing these injuries correctly. Anatomic reduction is of prime importance, as missed or inappropriately treated Lisfranc injury can lead to progressive instability, deformity and post-traumatic arthritis – and poor patient satisfaction . Stable undisplaced Nunley-Vertullo stage 1 injuries can be managed with use of a non-weight bearing cast for six weeks . If pain is still present at six weeks, an additional weight-bearing, removable boot can be given for further four weeks. If ligamentous disruption is present, prolonged immobilisation for up to 3–4 months may be required . Excellent results have been noted throughout literature with successful return to competitive play [6,20,28]. Displaced unstable injuries needs accurate anatomical reduction and surgical fixation . Timing of surgery is dependent on subsidence of swelling and skin wrinkling. Urgent fasciotomy may be needed if there is foot compartment syndrome . Open reduction with internal fixation (ORIF) has been recommended for 2mm or more of displacement for tarsometatarsal joints, medial cuneiform second metatarsal base displacement compared with the contralateral limb [24,36]. Rigid medial and middle columns need stabilisation with dorsal plating and/or screw fixation [37,38]. As lateral column is more mobile, it can be easily fixed with K-wires [3,10]. Percutaneous screws can only be placed if closed reduction under fluoroscopy is achieved. If anatomic reduction is not achieved by closed manoeuvres, open reduction is recommended . Different methods of internal fixation have been described in the literature but, generally, fixation is progressively achieved from medial to lateral and from proximal to distal. Once medial and central columns reduce, lateral columns commonly fall in alignment. More commonly, dorsal plating or transarticular cuneiform screw fixation along with first, second and third TMT screw fixation is employed. Lateral fourth and fifth ray can be left alone or fixed with transarticular screws . Though previously used, we do not employ K-wires any more for lateral ray fixation. An internal fixation stress study concluded that a transarticular screw was the most stable construct for the medial and central columns, while lateral column stability was not improved with screw fixation versus K-wire fixation . Absorbable fixation devices and suture button systems have also been described in the literature, with promising early results [36,40]. External fixators find their application in open fractures and for initial management of soft tissue swelling. K-wires can be removed at six weeks, if used at all, before weight bearing is commenced. Early screw removal at eight weeks leads to concerns about late displacement, while late screw removal may have complications including failure and increased risk of other joint arthritis [10,38]. These controversies related to screw removal have led most of the foot and ankle surgeons, including our practice, to adopt dorsal plates as an alternative for medial and central ray fixation (Figure 4). These plates avoid the complications related to screws mentioned above and have produced encouraging early results [38,41,42]. There have been few recommendations in the literature about arthrodesis as compared with open reduction and internal fixation in patients with extensive articular damage with multiple joint involvement [43–45]. 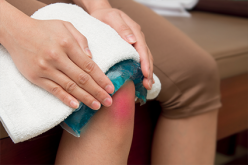 ORIF has been reported to progress to osteoarthritis in between 40 and 90 per cent of cases . These patients later have to undergo arthrodesis for their continual pain and deformity. Although results of primary arthrodesis have been promising, we believe initial anatomical reduction and internal fixation using the principles stated above can be key in preventing late arthritis. If needed, arthrodesis can be used as a last resort for patients with ongoing symptoms. Our current practice involves using the dorsal approach for these injuries with incision centred over the second metatarsal employing the Anchorage Plating system (StrykerTM). These plates are precontoured locking plates where threaded holes accept either 3.0mm or 3.5mm locking or non-locking screws. These plates are colour coded for ease of identification and non-locking screws can be angled 15 degrees from centre. Finally, we would like to highlight that Lisfranc injuries have a very broad spectrum of injury patterns with varied clinical presentation. They are very frequently missed and need a very high index of suspicion by clinicians. Once diagnosed, appropriate classifications allow a surgeon to choose between non-operative and an array of different operative interventions, keeping the patient’s needs and expectations in mind. There are very few other injuries in foot and ankle surgery which need accurate anatomical reduction apart from Lisfranc injury fixation. Both ORIF and primary arthrodesis have satisfactory results in the appropriate patient with a defined injury pattern. 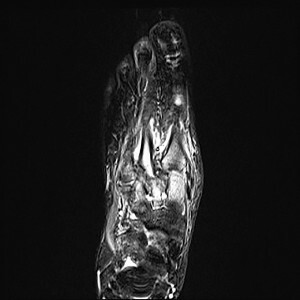 Figure 3: Coronal (long axis) STIR image showing extensive bone oedema at the bases of the first and second metatarsals (a) and in the middle and medial cuneiform (b) along with disruption of the Lisfranc ligament. There is widening of the space between the base of the first metatarsal and medial cuneiform. Figure 4: Intraoperative image intensifier view of open reduction and internal fixation with dorsal plate. 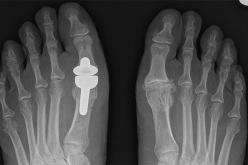 A separate screw fixation has been performed to achieve Lisfranc joint reduction. Figure 4: Intraoperative image intensifier view of open reduction and internal fixation with dorsal plate. 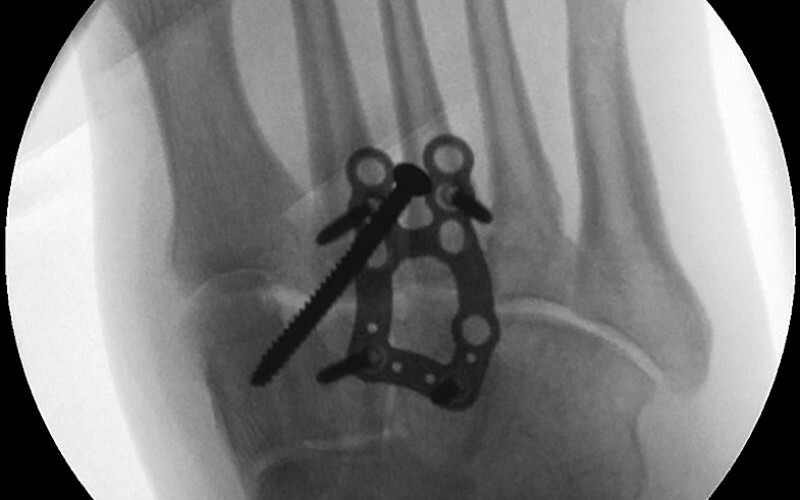 A separate screw fixation has been performed to achieve Lisfranc joint reduction. Hatem SF. Imaging of Lisfranc injury and midfoot sprain. RadiolClin North Am 2008;46(6):1045–60. 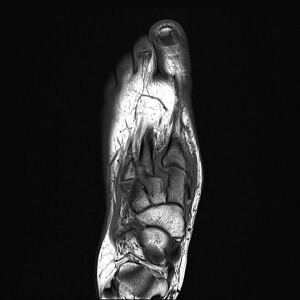 Crim J. MR imaging evaluation of subtle Lisfranc injuries: the midfoot sprain. MagnReson Imaging Clin N Am 2008;16(1):19–27. Myerson M. The diagnosis and treatment of injuries to the Lisfranc joint complex. The Orthopedic clinics of North America. 1989 Oct;20(4):655-64. Garrick JG, Requa RK. The epidemiology of foot and ankle injuries in sports. Clin Sports Med 1988;7(1):29–36. Meyer SA, Callaghan JJ, Albright JP, et al. Midfoot sprains in collegiate football players. Am J Sports Med 1994;22(3):392–401. Wright MP, Michelson JD. Lisfranc injuries. BMJ 2013;347:f4561. Kalia V, Fishman EK, Carrino JA, Fayad LM. 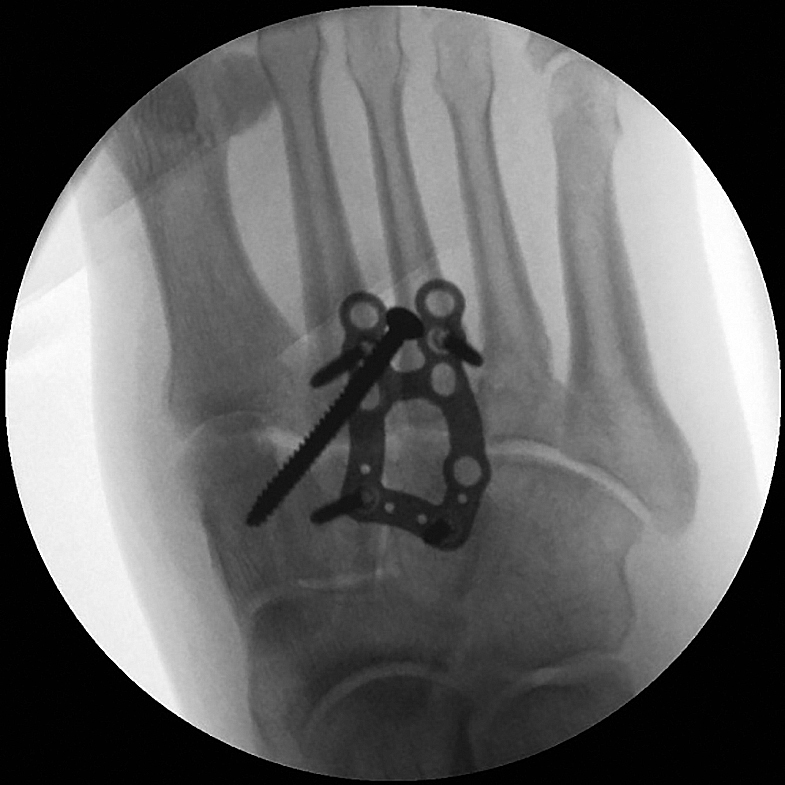 Epidemiology, imaging, and treatment of Lisfranc fracture-dislocations revisited. Skeletal Radiol 2012; 41(2):129–36. DeOrio M, Erickson M, Usuelli FG, Easley M. Lisfranc injuries in sport. Foot Ankle Clin 2009;14(2):169–86. Stavlas P, Roberts CS, Xypnitos FN, Giannoudis PV. The role of reduction and internal fixation of Lisfranc fracture-dislocations: a systematic review of the literature. IntOrthop 2010;34(8):1083–91. Coetzee JC. Making sense of Lisfranc injuries. Foot Ankle Clin 2008;13(4): 695–704, ix. Piecha G, Labovitz J, Seibert FJ, et al. The anatomy of the joint as a risk factor for Lisfranc dislocation and fracture-dislocation. An anatomical and radiological case control study. J Bone Joint Surg (Br) 2002;84-B:981—5. Sarrafian SK, Kelikian AS. Syndesmology. In: Kelikian AS, editor. Sarrafian’s anatomy of the foot and ankle: descriptive, topographic, functional. Philadelphia: Lippincott; 2011. p. 208–12. Welck MJ, Zinchenko R, Rudge B. Lisfranc injuries. Injury. 2015 Apr 30;46(4):536-41. 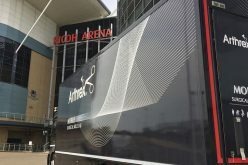 Kura H, Luo ZP, Kitaoka HB, et al. Mechanical behavior of the Lisfranc and dorsal cuneometatarsal ligaments: in vitro biomechanical study. J Orthop Trauma 2001; 15(2):107–10. Ouzounian TJ, Shereff MJ. In vitro determination of midfoot motion. Foot Ankle 1989;10(3):140–6. Quenu E, Kuss G. Etude sur les luxations du metatose. Rev Chir 1909;39: 231–336. Myerson MS, Fisher RT, Burgess AR, et al. Fracture dislocations of the tarsometatarsal joints: end results correlated with pathology and treatment. Foot Ankle 1986;6(5):225–42. Hardcastle PH, Reschauer R, Kutscha-Lissberg E, et al. Injuries to the tarsometatarsal joint. Incidence, classification and treatment. J Bone Joint Surg Br 1982; 64(3):349–56. Nunley JA, Vertullo CJ. Classification, investigation, and management of midfoot sprains: Lisfranc injuries in the athlete. Am J Sports Med 2002;30(6):871–8. Eleftheriou KI, Rosenfeld PF. Lisfranc injury in the athlete: evidence supporting management from sprain to fracture dislocation. Foot Ankle Clin 2013;18(2): 219–36. Benirschke SK, Meinberg E, Anderson SA, et al. Fractures and dislocations of the midfoot: Lisfranc and Chopart injuries. J Bone Joint Surg Am 2012;94(14):1325–37. Faciszewski T, Burks RT, Manaster BJ. Subtle injuries of the Lisfranc joint. J Bone Joint Surg Am 1990;72(10):1519–22. Aronow MS. Treatment of the missed Lisfranc injury. Foot Ankle Clin 2006; 11(1):127–42. Ross G, Cronin R, Hauzenblas J, Juliano P. Plantar ecchymosis sign: a clinical aid to diagnosis of occult Lisfranc tarsometatarsal injuries. J Orthop Trauma 1996;10(2):119–22. Davies MS, Saxby TS. Intercuneiform instability and the gap sign. Foot Ankle Int 1999;20(9):606–9. Shapiro MS, Wascher DC, Finerman GA. Rupture of Lisfranc’s ligament in athletes. Am J Sports Med 1994;22(5):687–91. Myerson MS, Cerrato RA. Current management of tarsometatarsal injuries in the athlete. J Bone Joint Surg Am 2008;90(11):2522–33. Rankine JJ, Nicholas CM, Wells G, Barron DA. The diagnostic accuracy of radiographs in Lisfranc injury and the potential value of a craniocaudalpojection. AJR Am J Roentgenol 2012;198(4):365–9. Vuori J, Aro H. Lisfranc joint injuries: trauma mechanisms and associated injuries. J Trauma 1993;35(1):40—5. Hermel MB, Gershon-Cohen J. The nutcracker fracture of the cuboid by indirect violence. Radiology 1953;60(6):850–4. Rogers LF. Radiology of Skeletal Trauma, 3rd Edition, New York: Churchill Livingstone; 2001, ISBN: 0443065632. Sherief, T.I., Mucci, B. and Greiss, M., 2007. Lisfranc injury: how frequently does it get missed? And how can we improve?. Injury, 38(7), pp.856-860. Raikin SM, Elias I, Dheer S, et al. Prediction of midfoot instability in the subtle Lisfranc injury. Comparison of magnetic resonance imaging with intraoperative findings. J Bone Joint Surg Am 2009;91(4):892–9. Thordarson DB, Hurvitz G. PLA screw fixation of Lisfranc injuries. Foot Ankle Int 2002;23(11):1003–7. Lee CA, Birkedal JP, Dickerson EA, et al. Stabilization of Lisfranc joint injuries: a biomechanical study. Foot Ankle Int 2004;25(5):365–70. Alberta FG, Aronow MS, Barrero M, et al. Ligamentous Lisfranc joint injuries: a biomechanical comparison of dorsal plate and transarticular screw fixation. Foot Ankle Int 2005;26(6):462–73. Zgonis T, Roukis TS, Polyzois VD. Lisfranc fracture-dislocations: current treatment and new surgical approaches. ClinPodiatr Med Surg 2006;23(2):303–22, vi. Baravarian B, Geffen D. Lisfranc tightrope. Foot Ankle Spec 2009;2(5):249–50. Cosculluela PE, Ebert AM, Varner KE. Dorsomedial bridge plating of Lisfranc injuries. Tech Foot Ankle Surg 2009;8(4):215–20. Purushothaman B, Robinson E, Lakshmanan P, Siddique M. Extra-articular fixation for treatment of Lisfranc injury. SurgTechnolInt 2010;19:199–202. Sheibani-Rad S, Coetzee JC, Givenas MR, DiGiovanni C. Arthrodesis versus ORIFfor Lisfranc fractures. Orthopedics 2012;35(6):e868–73. Ly TV, Coetzee JC. Treatment of primarily ligamentous Lisfranc joint injuries: primary arthrodesis compared with open reduction and internal fixation. A prospective, randomized study. J Bone Joint Surg Am 2006;88(3):514–20. Henning JA, Jones CB, Seitsema DL, et al. Open reduction internal fixation versus primary arthrodesis for Lisfranc injuries: a prospective randomized study. Foot Ankle Int 2009;30(10):913–22. 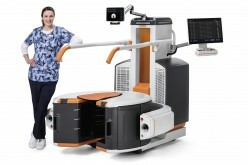 What is Cone Beam CT?